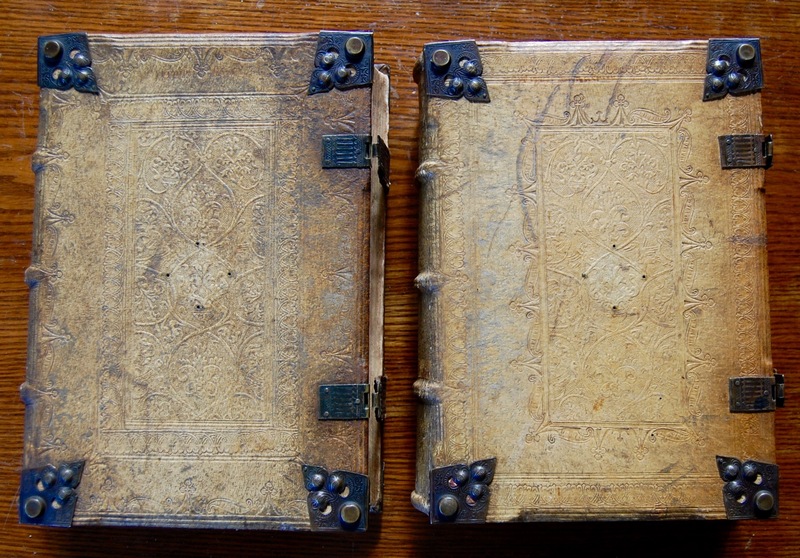 Two Folio volumes , 111/2 x 8 1/2 Inches . Fourth edition Vol I 1/8, 2-4/6, a8, b-g8/6, h6, i-Z6/8, A-Z6/8, AA-EE6/8; Vol II, (Lacking A1, title exactly the same as the first title excepting for the word ‘secunda’ see image above ) A8, B, C6, aa8, bb-rr8/6, ss, tt6, vv-zz, Aa-QQ8/6, RR, SS6, TT-ZZ, Aaa8/6, Bbb-Eee6. 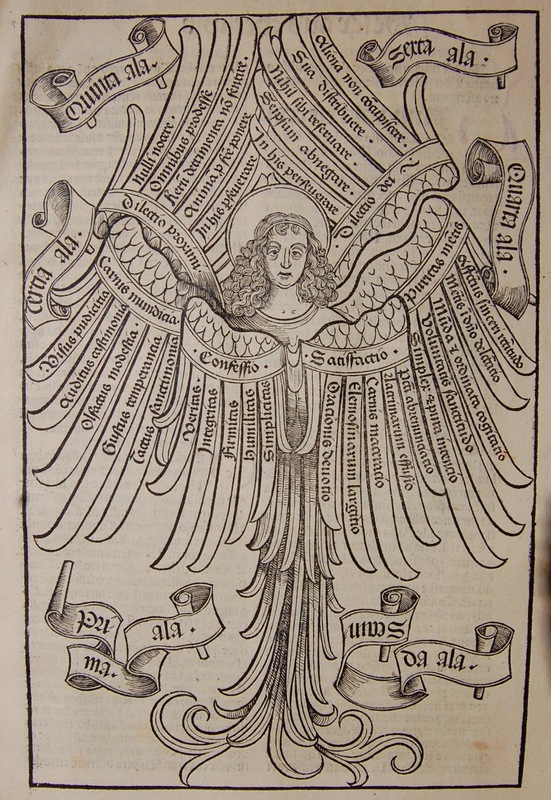 There are three full paged woodcuts two of the tree of sangunity and one of the order of Angels, Seraphim, etc. This is a very nice copy full of deckle edges and in original condition. Each volume of these copies is bound in full, contemporary blind-tooled calf over wooden boards. They retain all 16 corner pieces as will as both sets of clasps. 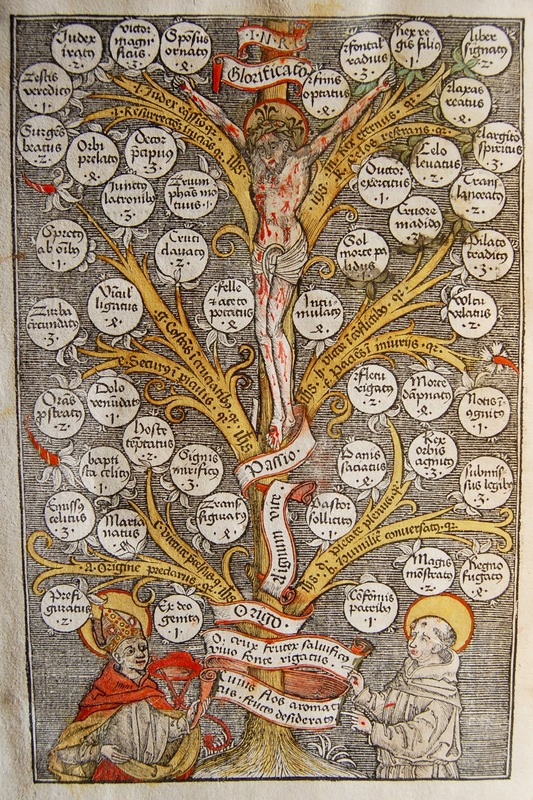 In this wonderful copy the first woodcut _(a1verso ) of Christ crucified on the tree of sanguinity has been coloured, the two other woodcuts have non. Both volumes have been nicely rubricated throughout with red Lombard capitals supplied as well. 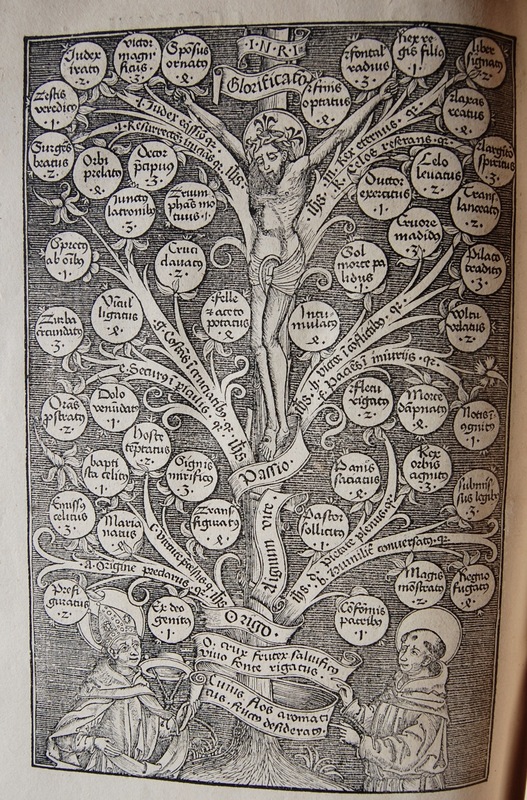 Goff B-928 (listing only five institutions holding complete copies); BMC I 144; Pr 639; Hain B468; Polain 777; Pell 2616; GW 4648; Walsh 258; Chrisman, “Bibliography of Strausbourg Imprints,” C1.2.10.